This dispatch is coming in from the top of Kala Pataar at 18,700 feet on May 26. Peter, Min and myself are proudly standing on the top on this beautiful afternoon. Everest is exceptionally majestic and has been behind our shoulders the entire way as we walked to the top. It’s a beautiful day up here. 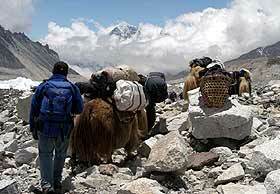 Our group arrived at Base Camp late yesterday morning and we spent about 24 hours at Everest Base Camp. Lloyd and Peter will be able to tell a lot of stories when they get home about how different this experience was than they could have imagined, how interesting and rich it was. In particular, it’s noted, as always when visitors first go to Everest Base Camp, that it is on a dynamic and harsh moving glacial moraine. You see tents pitched on little towers of ice; you see people who have been living for weeks and weeks on a glacial moraine. Lloyd commented as well about how there is a very marked difference in the attitude and tone from the different teams. Some teams are celebrating with great success. 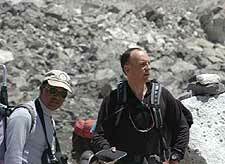 Others seem quiet and determined, with the summit ascents that are still coming. Others seem thankful, respectful and reserved about having turned around and now coming back down alright but without having stood on the summit of Everest. We’ve seen people with severe frostbite in recent days. I’ve seen a number of people, including Kami and Nima Tashi and John from the very successful Peak Promotions team, who had the satisfaction of a great ascent behind them and they look strong and well as they head down the mountain. Each team is on its own with its own thoughts. 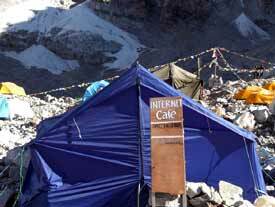 There are a lot of different stories going on at Base Camp now. I’m reminded that Everest is still about teams executing and climbing on their own, realizing their dreams at different levels. Thankfully, Everest is still not a place where a government organization is responsible for rescue. 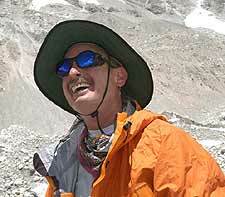 Each team should be responsible for its own Sherpa and its own climbers, willing to ask other teams for help but not depending, as is sometimes the case on Aconcagua in Argentina or Denali in North America, on the government or a government organization to bail them out when things go wrong. Amazing group of people at Everest Base Camp and we feel privileged to have visited. And now back to our own triumph on Kala Pataar, small compared to what has been seen by people on Everest in recent days, but still a mountaineer’s dream to be at 18, 700 feet on this glorious afternoon in the Himalayas.